This weekend marks the date that I crossed the last t on my thesis and now all I do is take it to be bound and hand it in before I head off to the Edinburgh Festival midweek. Whilst I was printing off the thesis in our spare bedroom I noticed the plant in the window had started to flower. We’ve had it for twenty years, it belonged to my partner’s grandmother and we took it when she passed away, I have no idea how long she had it for. 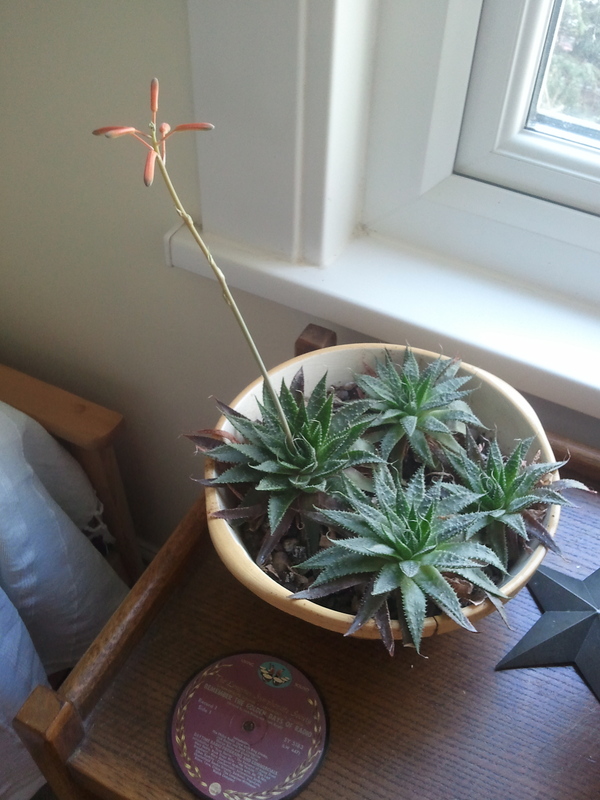 We’ve been very hard on this plant, (as we are with all the succulents we have), we forget to water and we shove it away on a North facing window but now, amazingly, it has presented a flower, and why now? ‘the “host” is already the layered “space” formed by lived experience, so that the givens of site-specific performance comprise not only the machinery of “place”, but also the patina it has acquired with past use’ (2004: 374). The term that Turner uses “host” comes from Cliff McLucas of Welsh theatre company Brith Goff. The “host’ was his term for the site, the building or space that was “hosting’ the performance. The performance, in turn was the “ghost” which was/is brought to the site. I was now playing a host within my “host” – the site, and a host within my “ghost” – the performance, moreover the voices I had used to create Vera were also the voices of ghosts, people who had passed away. Maybe with all this research into Vera she is ghosting us in other ways – just to let us know! This entry was posted in Research, Uncategorized and tagged Cathy Turner, Palimpsest and Potential Space, site specific performance on August 19, 2013 by Ruth.